Seattle is blessed when it comes to winter warmers and spring-infused drinks. Relish the taste of the seasons with these Emerald City favorites. When it’s nippy outside, bundle up and take to the bars for festive imbibing. The lakeside, nautically themed wonderland of Westward (*2501 N Northlake Way; westwardseattle.com) might look summer specific, but the cocktail aces behind the bar mix up drinks to be enjoyed at the outdoor fire pit 365 days a year. Order a hot toddy to warm up. The whiskey stout hot chocolate (add a dash of chartreuse) is another favorite and comes served in a thermos for maximum toastiness. 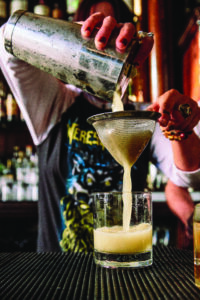 For more winter cocktail classics, Ballard’s Young American Ale House (1744 NW Market St; mariahinesrestaurants.com) takes hot buttered rum to the next level with a lavish house-made batter. Meanwhile Hazlewood (2311 NW Market St) does a mean scratch hot toddy, served in a handmade knitted drink sleeve, just up the street. The secret ingredient is pimento dram, an aged West Indian liqueur made in-house with dark rum, brown sugar, and allspice berries. At the Capitol Hill lounge (607 Summit Ave E; sunliquor.com) for local distillery Sun Liquor, bourbon, rum, and brandy are used to compose its 30-day-aged eggnog. The limited-edition batches are sold exclusively on Christmas Eve and Christmas Day. Also in the holiday spirit, Rob Roy (2332 Second Ave; robroyseattle.com) in Belltown rolls out the red carpet for the season with its “advent calendar of cocktails,” a collection of tiki drinks, updated classics, and creamy favorites like the Tom and Jerry, a marriage of rum, cognac, egg, hot milk, clove, allspice, and nutmeg, all topped with truffle salt. If you like it hot but sans alcohol, try an horchata latte at the pint-size TNT Taqueria (2114 N 45th St; chowfoods.com/tnt-taqueria). The nondairy Mexican sipper (typically made with rice or almonds) is completed with a made-to-order churro and served all day long at the walk-up window. If chocolate is your calling, Dilettante Mocha Cafe (multiple locations; dilettante.com) pours chocolate beverages at its three locations, where patrons choose from five cacao percentages to customize their decadent steaming drink. Hot Cakes Molten Chocolate Cakery (multiple locations; getyourhotcakes.com) tickles sugar fancies—and Harry Potter fans—with a toasty butter beer (butterscotch, fresh apple cider, ginger, and optional sparkling wine), while chocolat chaud is sipped like a Parisian at Le Pichet (1933 First Ave; lepichetseattle.com). 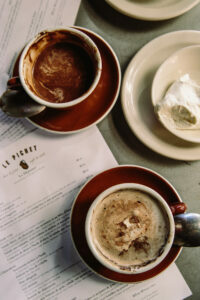 Enjoy the French-style hot chocolate, freshly made, at the cozy cafe outside Pike Place Market. Last but not least, seasonal beer releases from brewing favorites embrace the winter spirit. In SoDo, Two Beers Brewing (4700 Ohio Ave S; twobeersbrewery.com) gives a nod to the flavors of the moment with its Fall Line Russian Imperial Stout, aged on cherries, vanilla, and cacao nibs in brandy barrels for six months. Nearby, Schooner Exact Brewing (3901 First Ave S; schoonerexact.com) releases its small-batch Hoppy the Woodsman, a rich and roasty ale that strings hops through the palate. On the other side of town at the state’s original brewpub, Big Time Brewing (4133 University Way NE; bigtimebrewery.com) in the University District brings out one of its winter favorites with a cult following, Old Wooly, a barleywine ale. A new season brings lighter, brighter drinks packed with fresh flavors. At Capitol Cider (*818 E Pike St; capitolcider.com) in Capitol Hill, bartenders mix drinks featuring their main squeeze: cider. 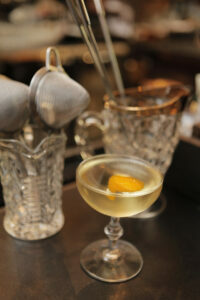 Try the Dictator’s Daughter, a blend of iced cider, aperitif liqueur, white vermouth, and brandy that sips bright. Italians know the bliss of an aperitif libation, and Artusi (1535 14th Ave; artusibar.com) pours a classic spritz made of Aperol, prosecco, and soda. On the south side of the Fremont neighborhood, farm-to-table-focused Eve (704 N 34th St; evefremont.com) embraces the craze behind drinking vinegars and mixes house-made shrubs into vibrant cocktails like The Sun Also Rises, a tropical blend of rums, lime, and a scratch juniper-sangria shrub. Botanists dig the infusions at Ballard’s Percy’s & Co. (5233 Ballard Ave NW; percysseattle.com), a bar inspired by the herbal potables of an apothecary. The Awakened One blends Lillet Blanc, lemongrass-infused vodka, pineapple juice, lime, ginger, and cilantro for a zippy sip. Another purveyor of tinctures, E. Smith Mercantile (208 First Ave S; esmithmercantile.com) crafts its Ford cocktail from Dolin Blanc, gin, orange bitters, and the herbal Benedictine liqueur. Vietnamese staple Monsoon (615 19th Ave E; monsoonrestaurants.com) also plays with botanicals behind the bar. Take the house gin and tonic: gin is shaken up with marigold and chamomile tonic syrup and topped with prosecco and basil seed. As the skies clear, crack open spring beer releases to celebrate. Fremont Brewing’s (*1050 N 34th St; fremontbrewing.com) 77 Select is a must, to be consumed from the can or at the brewery’s spacious urban garden. A refreshing toast is the award-winning gose from Reuben’s Brews (5010 14th Ave NW; reubensbrews.com), a traditional German ale brewed with salt and coriander that has a tangy, fruity profile. Pike Brewing Company’s (*1415 First Ave; pikebrewing.com) Saison Houblon is another beer to try at the brewery located in the nucleus of Pike Place Market. All this means there’s always a reason and a season to raise a glass in Seattle.